Zapiro published a cartoon on the recent case of a man who had prostate cancer and wanted to end his life via assisted suicide. The court ruled in his favour and allowed him to choose how he wanted to die.This has unleashed a plethora of opinions and perspectives about morality, rights, dignity and death. We both parties on opposing sides advancing good arguments for their respective position. 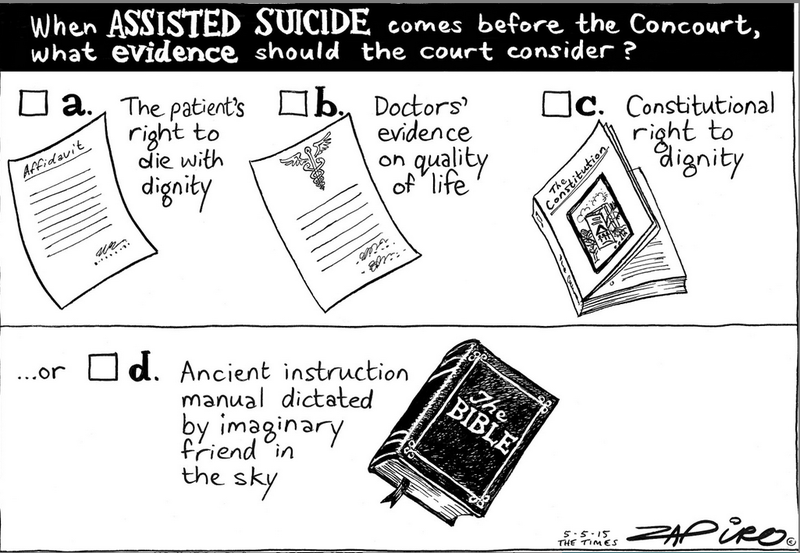 Zapiro’s cartoon depicts four pieces of possible evidence which the court should consider in making their decision. The first three pieces of evidence are shown at the top and are: the patient’s right to die with dignity; Doctor’s evidence on quality of life; and the constitutional right to dignity. The one piece of evidence at the bottom is “an ancient instruction manual dictated by an imaginary friend in the sky” also known as the Bible. The argument that Zapiro seems to be advancing is that opinions based on the Bible cannot be included or are irrelevant in ethical issues such as these. What we must appeal to as the highest authority in these sensitive cases is the autonomy of our individual rights and the constitution. My main objection to Zapiro’s argument besides the obvious ad hominem attack is that he seems to betray his ignorance in the history of how the concept of human rights was formed and the presuppositions underlying the constitution. The idea of human rights is the cornerstone of modern democracy and politics. John Locke, one of the most influential philosophers in politics whose ideas shaped the American constitution, said humans have intrinsic natural rights which cannot be violated. The state is created in order to protect and preserve those universal inalienable rights. Thus the state subjects itself to the Bill of Rights, which recognizes the inalienable universal rights that humans have and must uphold them. The question is where do these rights come from? What is it about humans that gives them worth, value and dignity? They cannot come from the state nor from society because they would no longer be universal, intrinsic and inalienable. If rights come from society or the state, then the society can choose who to give them to, and who to take them from. Therefore if rights are grounded in society then when society decides to colonise, segregate, enslave or establish apartheid – it isn’t violating anyone’s rights. America’s founding fathers recognised this problem and realised the only basis for inalienable and universal human value is if they are given by God, hence the declaration of independence says“We hold these truths to be self-evident, that all men are created equal, that they are endowed by their Creator with certain unalienable Rights, that among these are Life, Liberty and the pursuit of Happiness”. It is the biblical worldview historically and philosophically which shaped the very idea of human dignity and inalienable rights. So it is quite ironic that the very thing which gave birth to the modern political concept of human rights, the underlying foundation for objective human value and dignity is now being ridiculed as not being relevant on ethical issues. The secular naturalistic worldview as demonstrated by philosopher David Hume and others since the enlightenment have demonstrated that it cannot supply us with the very moral norms we need to make such decisions. Historically the idea of human rights has a long heritage in christian thought. Francisco Suarez and Franciso de Vitoria were influential theologians during the pre-reformation and renaissance who put forth the idea that man-made, or government laws should not over-ride human’s natural rights to life and liberty. The basis was that we can use our reason to arrive at natural laws (an idea first articulated by Christian medieval scholar Thomas Aquinas). Aquinas said natural law is derived from divine laws – however we can arrive at natural law by observing human nature and its ends. The basis for natural law is what Aquinas termed God’s eternal law which determined the end for which humans were made. All laws made by rulers should be in the interest of the people as a whole. Suarez first put forth the idea of a social contract and separating secular and sacred power, specifically referring to the catholic’s dominance in politics. Locke later formulated this idea and etched it out to have a certain secular appeal however its roots are firmly rooted in christian thought. Various enlightenment writers used natural law as a cornerstone in liberal theories. The idea of universal human rights was not a ubiquitous concept -in Greek democracy Aristotle thought that some people were born to be slaves and others masters, in Rome deformed children could be legally discarded – something that stopped when Christian gained significant social influence in Rome. The historical development of human rights has its birth in the christian millieu where each human being is seen as possessing universal worth. The question of whether assisted suicide should be legalized is a delicate one, and requires all perspectives and voices to be heard, none should be ridiculed or excluded but understood and weighed. It is also crucial in the debate for people with different perspectives on the issue to realise that no one comes into the debate with a neutral set of presuppositions. Zapiro’s secular world view presupposes that: each individual is morally autonomous; we are morally accountable only to ourselves; there is no ultimate purpose for which humans are made for; happiness can only be found in the pursuit of individual desires. The Christian worldview presupposes that only God is morally autonomous and we are morally accountable to him; there is an ultimate purpose we are made for; happiness can only be found in the pursuit of a relationship with God. From these different faith presuppositions we make choices about what is good for society and what laws should be upheld. So let us not fool ourselves into thinking that one party is neutral and the other is bias. Zapiro has not employed the principle of charity, his cartoon undermines the very freedoms he idolises in advancing the exclusion of particular views on the basis of their worldviews. It is also ironic that the very thing that Zapiro ridicules as being outdated and imaginary was very instrumental philosophically and historically in the development of our modern view that humans have inalienable universal rights.